Sweatshirts, polo shirts, fleeces and PE kit are available from the school. Uniform orders are placed regularly each term. There are a selection of sweatshirts in school to try for size.The child’s initials can be embroidered on to the uniform. This helps with locating lost items of clothing. Please ensure that all other items of clothing are named. In addition all children will need a PE bag and a school book bag. No jewellery, body piercing or tattoos must be worn in school. Football shirts, coloured trainers, sportswear, and jeans are not suitable for school and should not be worn at any time. Hair should be smart and clean and suitable for all activities. Long hair needs to be tied back for PE activities. Coloured hair, patterned trimming and closely cropped styles are not appropriate to a school environment. 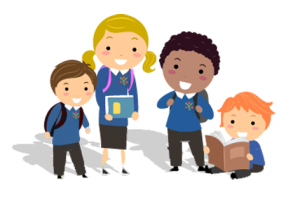 School cannot accept responsibility for loss or damage to personal property – clothes, own equipment, pens, calculators, toys, money or watches. School provides all the equipment that the children need in school. Lost property is regularly displayed for the children. Parents who wish to check the lost property can do so via the office. Lost property is cleared at the end of each term and sent to a charity shop.